There are two devices, aptly called Portal and Portal+, which come in a 10-inch 1280 x 800 display will retail for $199 USD and a 15-inch 1920 x 1080 version that will retail for $349 that has the option for the display to change between portrait and landscape mode. Unfortunately, Portal devices are only scheduled for a November release in the United States with no set Canadian availability. Portal works by connecting to your friends through Facebook Messenger, but you’ll also be able to call them if they don’t have a Portal (up to seven people at the same time). 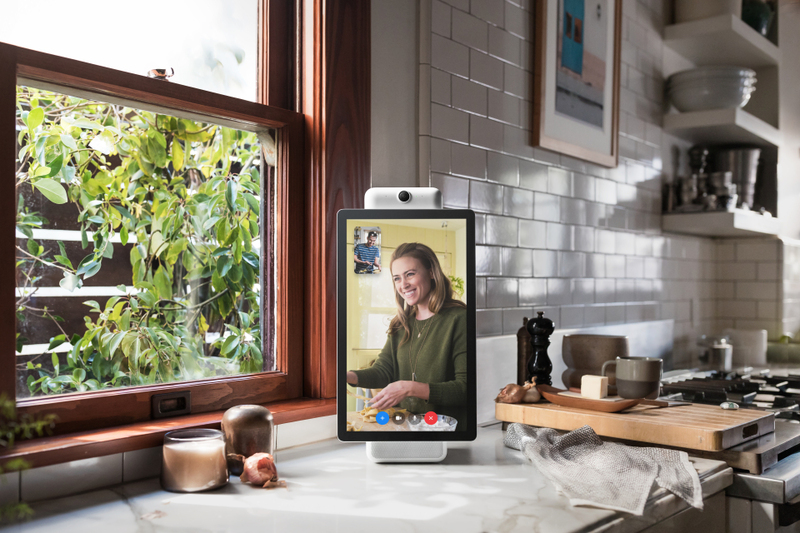 Similar to its competitors, Facebook has programmed Portal to operate by saying “Hey Portal” and gives you the option to start a video call hands-free. Amazon’s Alexa is built-in — which is a surprising partnership — and allows you to ask about traffic, weather, news, order products, or control other smart home devices. In addition to a partnership with Amazon, Facebook has partnered with Spotify Premium, Pandora, and iHeartRadio, Food Network and Newsy. Since security is a major issue for everyone, especially with all the security breaches Facebook has experienced within the last year, the company stated that users can completely disable the camera and microphone, and each Portal and Portal+ comes with a camera cover to block the camera lens.